Rubbings are taken of the windows using archival vellum—to ensure the longevity of the documentation. 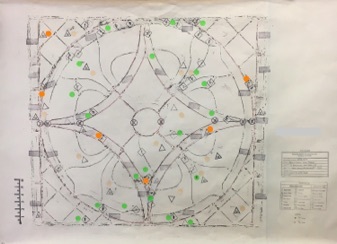 Important information is recorded on the rubbings such as dimensions, locations of damaged glass, lead sizes, support bar locations, tie-wire attachment points, and methods used to repair or replace the glass. These rubbings become the historical blueprint of the windows and preserve a record of their prior condition and the restoration work that has taken place, which can be invaluable in case of catastrophe. Also, future generations can approach further restoration with an informed knowledge of what has been done in the past. After the initial documentation is complete, the windows in need of full releading are carefully dismantled. 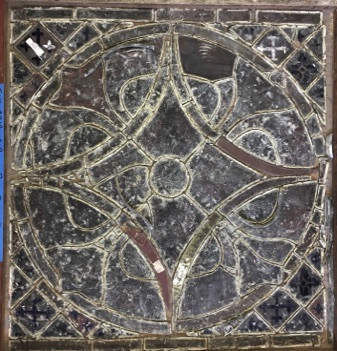 The old, deteriorated lead is cut out and properly disposed of, and the glass is gently removed and placed in wooden trays for the next step in the restoration process.